Posted on September 25, 2018 at 8:13 pm. Yesterday, Google announced a number of big product changes at a press conference in the company’s home city of San Francisco. The shakeup, which is in honour of the company’s upcoming 20th anniversary, unveiled a ‘major update’ to the Google feed experience. The feed will now have expanded features in addition to a new name; Discover. Promising to be much more than simply a name change, Discover aims to be a bespoke feed which will enable you to find new and interesting content based around your personal interests. Alongside this, Google unveiled a brand new look, which it claims will ‘make exploring your interests easier than ever’. This includes a new layout which features topic headers to enable users to easily explore whichever topic appeals. A common complaint with the social media feeds is that they are hard to customise, with unknown algorithms deciding for the user what they should, and shouldn’t see. Discover aims to change that. Google has included a control icon to personalise your content stream, enabling you to tell Discover what you want to see more, or less of. As shown with this example from Google’s key note. Unlike social media feeds, which push what is currently trending and gaining the most engagement (although not chronologically), Discover will combine latest news and evergreen content. The overall aim of this approach is to find a tailored stream of content, whether it be articles, videos or images, that might not ‘be new to the web, but are new to you’. From an SEO point of view, the inclusion of more evergreen content will give brands and websites the opportunity to consistently perform well over a longer period of time. As well as this, Discover will favour a high percentage of AMP content, enabling a quick and seamless user experience. The combination of a fast-loading, bespoke feed which includes both evergreen and news content could result in Google’s homepage becoming more than a destination for simply conducting searches. Imagine a world of Google pulling in feed of related content based on your travel plans, your sports team, your search history based on a new hobby you have been researching… maybe a bit creepy! However, Discover wasn’t the only big news Google announced yesterday, the company also released new information about Google Lens, its visual search tool. Google Lens, which can detect and analyse objects in pictures and then show relevant images, will migrate from iOS and Android over to the web. Also, Google has released some more information around Google Stories. The ‘stories’ format, which has seen phenomenal success on Instagram, will be adopted by the Google on the company’s actual birthday, 27th September. 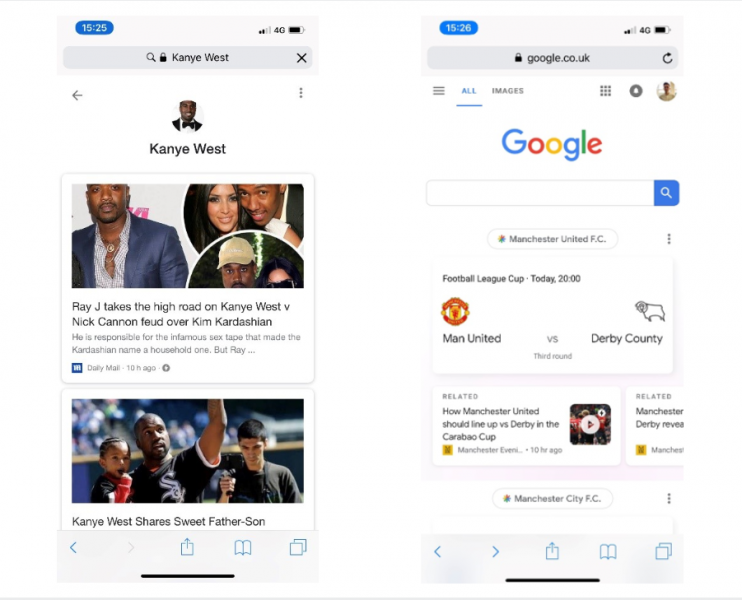 In February, Google soft launched the stories function with eight publishers, including Vox Media and The Washington Post, and will no doubt be aiming to see users react as positively to this new format in search as they do in social. Stories hasn’t started being used widely yet, so here is an example from Google showing how this function will work once it’s launched. With all these key updates announced in time for the company’s 20th birthday it looks set to be the biggest shake up in search Google has pushed in recent years. As Cathy Edwards, director of engineering at Google images stated; ‘when search first began, our results were just plain text.’ The inclusion of Discover, Lens and Stories as well as ‘a range of new features that use AI to make your search experience more visual and enjoyable’ leaves us asking; what will Google look like in on its 30th birthday? !